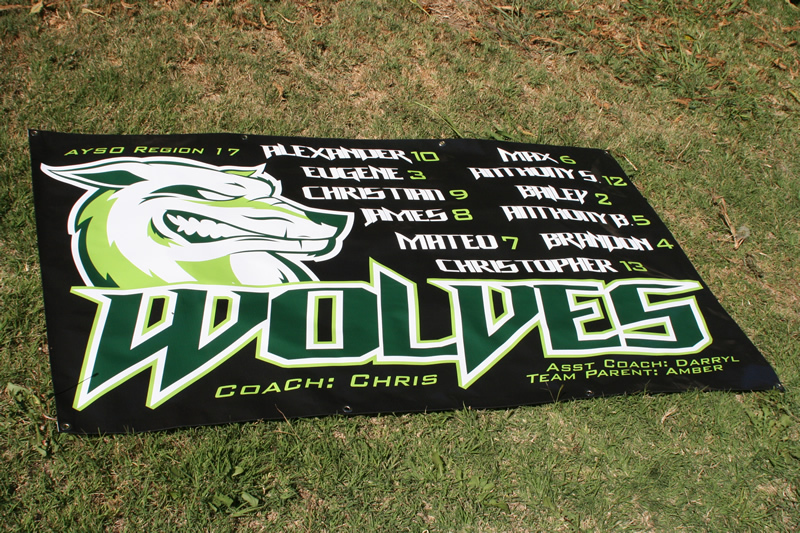 Show your pride with one of our Custom Team Banners! What is a season without a team banner or pennants? Belly Itcher Sports provides high quality 13oz custom team banners with multiple finishing options (Pole Pockets, Grommets, etc…). Our banners come complete and are of the highest quality. Custom team banners should display the team name and players proudly. Sponsors love a nod on your banners as well! Businesses and individuals appreciate being displayed somewhere on your banner as a “thanks” for supporting the team. What sets our custom team banners aside from the rest? Every custom team banner we design is custom with a unique, one of a kind design. 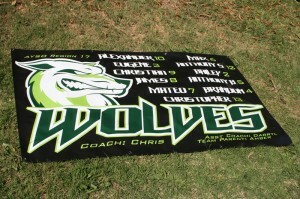 Our youth sports banners get tons of compliments for the unique colorful style we produce! We also have other options available including Nylon Flags, Drop type cloths and pole flags. Sports organizations trust us to print their sponsorship banners as well. We provide design services FREE OF CHARGE with ALL sponsorship banner orders.